Visit the Adriatic coast means walking through history, art, culture and traditions. It means “sweet life” of the nightclubs, and a seacoast where the sand is fine by low seabed. 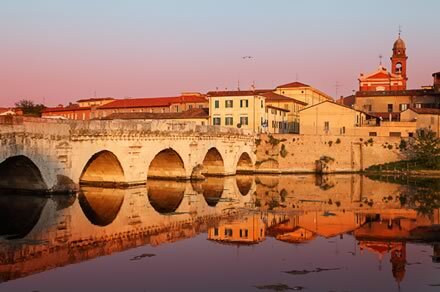 Discover Rimini, is walking in the culture. The old town of the city offers invaluable architecture where the different eras from the Roman left traces of their passage. You will admire churches, shrines, squares, palaces and beautiful monuments, visited each year in each period of countless visitors. Among them: Arco di Augusto, the Roman Amphitheatre, the The Surgeon’s House, the Church of San Giuliano Martire, the Cathedral and the Malatesta Temple. Rimini is also famous for the many clubs spread along the coast and the city, the shops and the music, theatre and cultural activities. Romagna is also well known and famous as the land of hospitality. Maximilian’s Hotels is a hotel chain with elegant and refined 4-star hotels, promises excellence in this land of history, and fun holiday! From our hotels in Rimini, you can easily reach the true heart of the tourist area, for all the true focus of summer life: Marina Centro of Rimini. Connected to the historic center by the prestigious Viale Principe Amedeo, Rimini Marina Centro is the destination for all those who want to enjoy a holiday in the city: In the summer streets and the square are full of life, between markets, twinkling lights from the windows of small shops and boutiques overlooking the city center and much more. Leaving from our hotel on the seafront in Rimini will have at your disposal all the centrality of Rimini, for a perfect holiday. Here you will find typical restaurants of fish, or fast food to nibble with your drink something quickly before returning to the beach or walking. Shopping lovers can have fun in the little souvenir shops or letting yourself be charmed by the most prestigious boutiques on the boulevard. 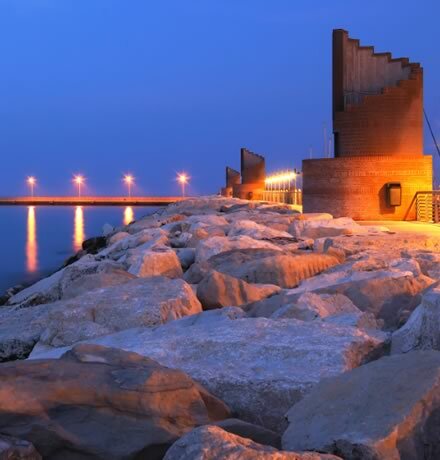 If you come to Rimini for business you can enjoy the special position of Marina Centro for to easily reach the business heart of the city: Sporting, Ambasciatori and Continental are ideal for those seeking for hotels near the Fiera di Rimini that allows you to fully enjoy also your moments of freedom. A moment to pause, and you can take advantage of the nearby Parco Fellini, large garden of a small town so romantic and charming, dedicated to Federico Fellini, history of Italy and Cinema in the World.